The bar chart shows the number of overseas students enrolled in a third year Computer Science course at a Canadian college. According to the bar chart, students from four Asian countries (China, Singapore, Malaysia and Sri Lanka) and one European country (France) are taking Computer Science at the collage. Some students are enrolled in the Database core option; the others are taking Networking. Overall, the China has the largest number of enrolled students (17) and France has the smallest (5). Singapore and Sri Lanka both have 12 students; Malaysia has 11. It is noticeable that Singapore and Sri Lanka have similar profiles. Students from all five countries are enrolled in Database, but more males are taking this option than females (21 and 9 respectively). For each nationality, the males taking Database outnumber the females, except in the case of French students with 3 females to only 1 male. The China has the most students studying Database (9); Sri Lanka is next with 7, while Singapore has 6. Malaysia and France have 4 Database students each. 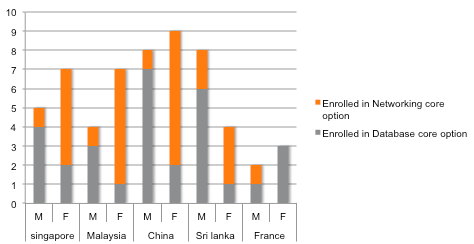 As for Networking option, more females than males are enrolled from every country except France. In fact, no female French students are taking Networking. Only 1 male from each country is enrolled in Networking, except for 2 males from Sri Lanka. Test tip: In the main body of your report, you may organise the information in this way; first group the information. Then compare and contrast the data. After that, select important information to report.